HOPEFULLY by this stage you have at least tried on those shiny new trainers writes Jim Clinton. I normally wear my new trainers for a few days, walking about in them to break them in. Then it is a few miles jogging/running building up to a weekly mileage that suits whatever race/run I am preparing for. Don’t buy a pair just before your chosen run/race. They need to be broken in or you will end up with blisters! As with all your running gear, every piece will need tried out before the big day. Do not turn up on the day looking like a ‘Burtons Dummy’ as they said use to say. Comfort is the key, not looks. The spotlessly clean trainers, the beautifully matching shorts and t-shirts are all fine, but are they comfortable? You might wing it on a parkrun but once you head towards your 10k, half marathon or God forbid, a full marathon, what you chose to wear on the day could be the deciding factor on whether you enjoy your run or declare you will never run again. If you are lucky enough to have got into one of the ‘Couch to 5k’ sessions, downloaded an app or decided on your own plan, stick at it. Have you found that running buddy? It is a lot easier if you have a friend or two to train with. Above all, follow your plan. Don’t try to cram it all in quickly. Take it easy. If you’re a complete beginner, walk. If you have already done a few parkruns then build up the mileage and the days. Always have rest days. You need to recover from your runs. This will allow the muscles to recover and help prevent injuries. 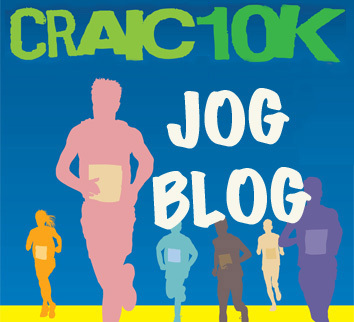 With the St Patrick’s Day Craic 10k fast approaching, an injury is the last thing you want. So get along to the Kennedy Centre or Cityside and get registered. Registration can also be done online. This is your goal. You can do this.